Time for another quick look at free gifts of the past. 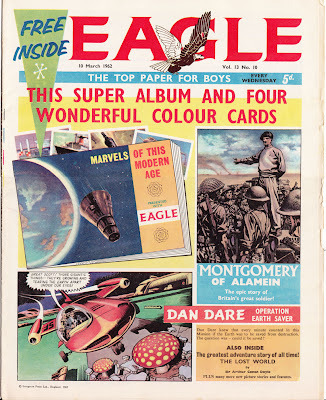 Back in 1962 Eagle had a revamp, bringing in new stories such as Frank Bellamy's stunning story of Montgomery of Alamein. Accompanying the new look was a free 12 page booklet Marvels of this Modern Age along with the first four cards of a 12 card set. 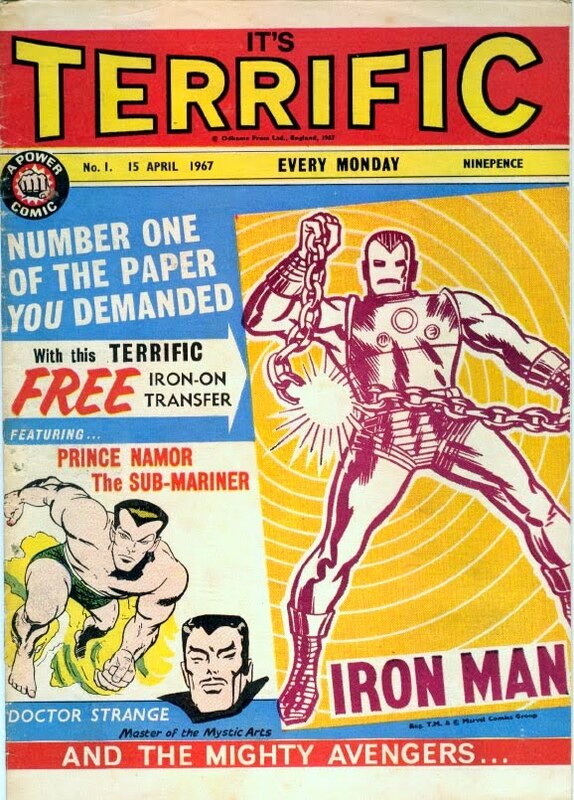 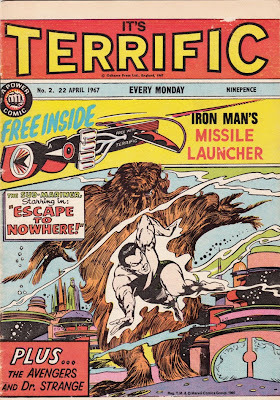 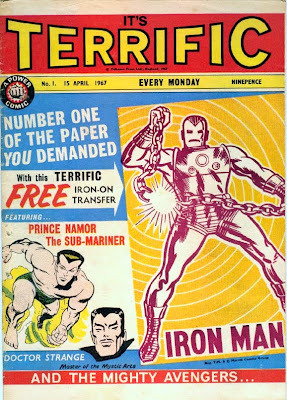 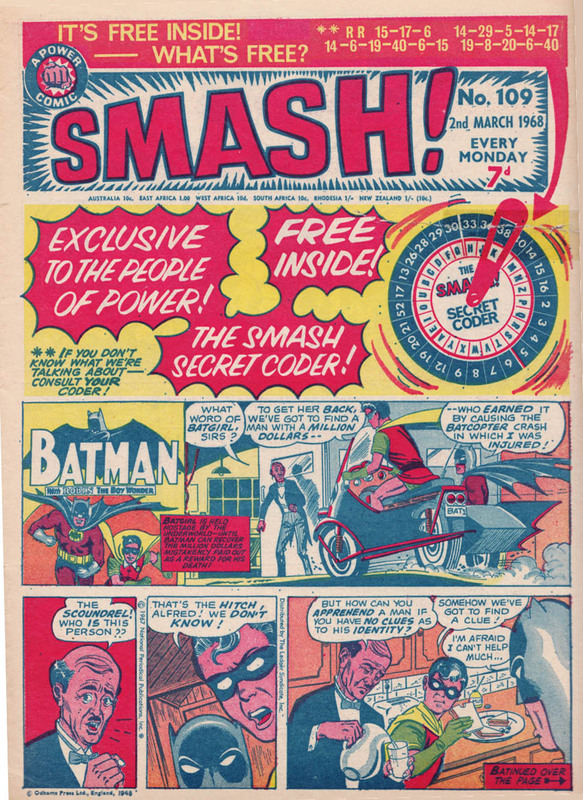 In April 1967 Odhams launched the fifth and final title of their "Power Comics", Terrific and the first issue included a free Iron Man iron-on transfer. 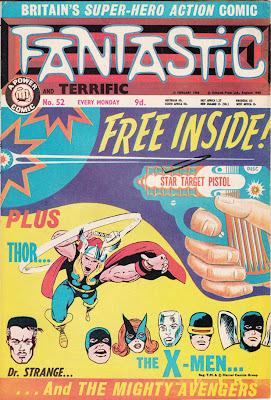 Issues 2 and 3 of Terrific also had free gifts. 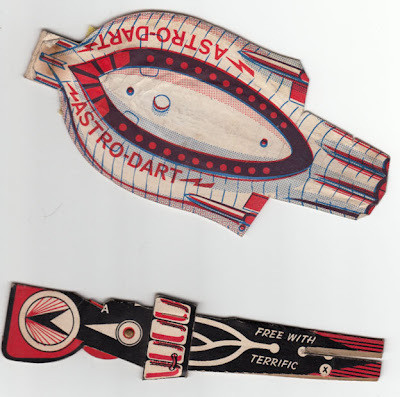 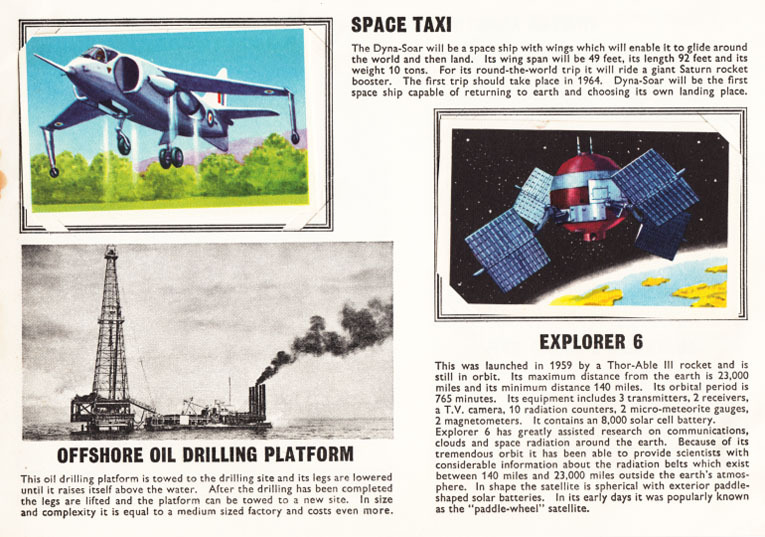 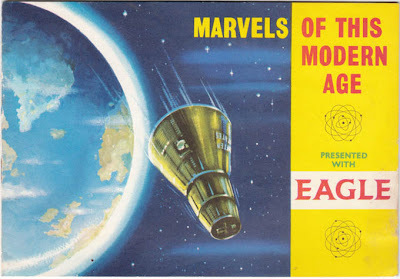 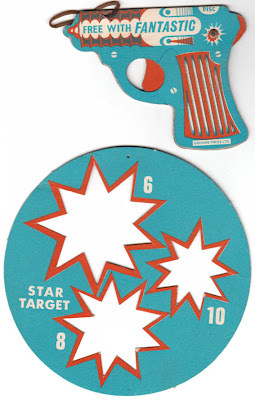 A Missile Launcher in No.2 and the Astro Dart in No.3. 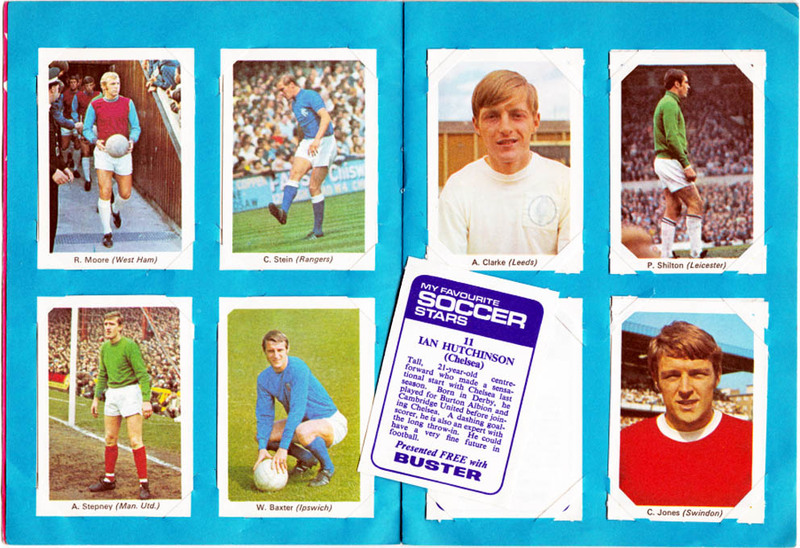 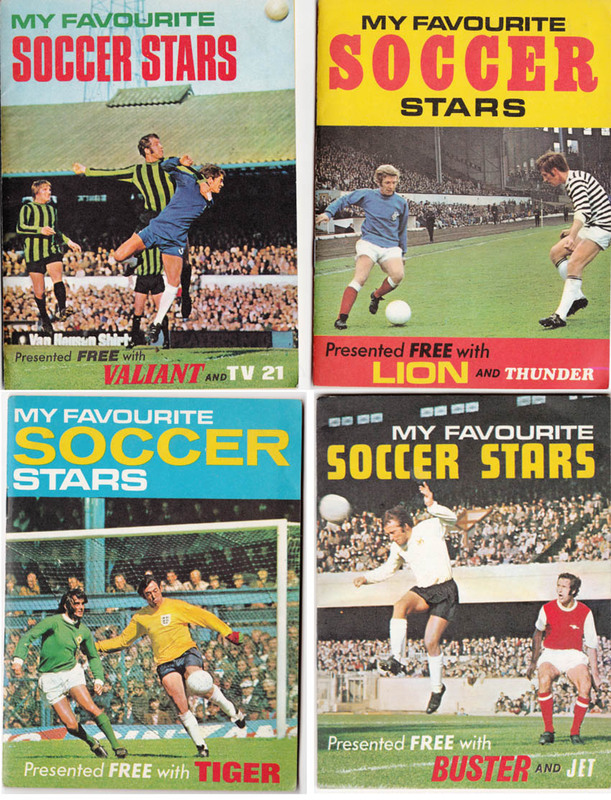 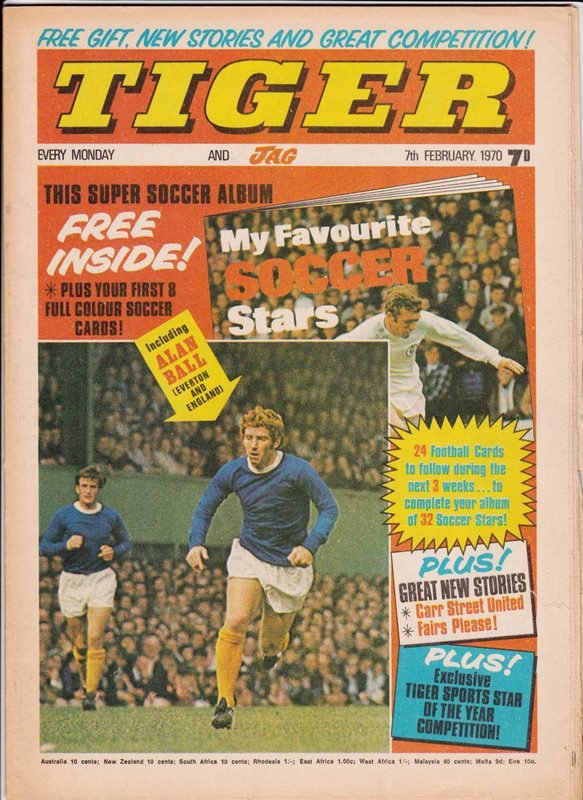 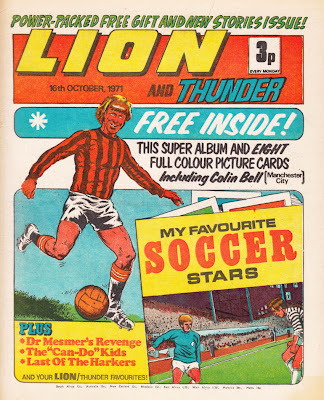 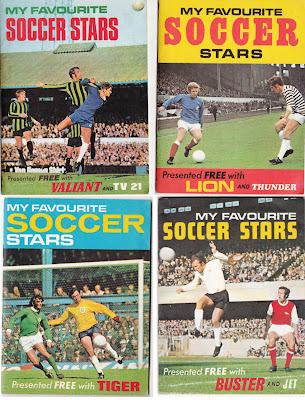 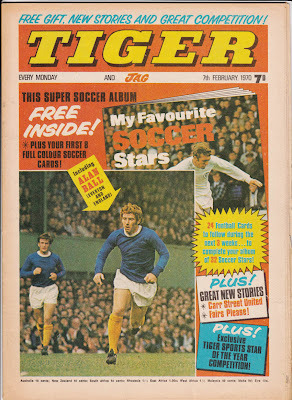 In 1970 IPC had a promotion across five of their comics in the same week, with Buster, Tiger, Scorcher, Smash, and Lion each giving away a 12 page booklet called My Favourite Soccer Stars along with a set of picture cards. It must have been a popular free gift because a year later they repeated it with a brand new set in Valiant, Lion, Scorcher, Buster, and Tiger. 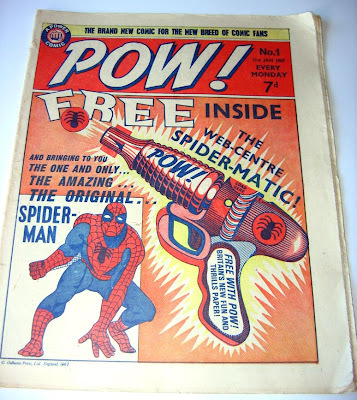 Here's another helping of free gifts that were given away in British comics of the past. 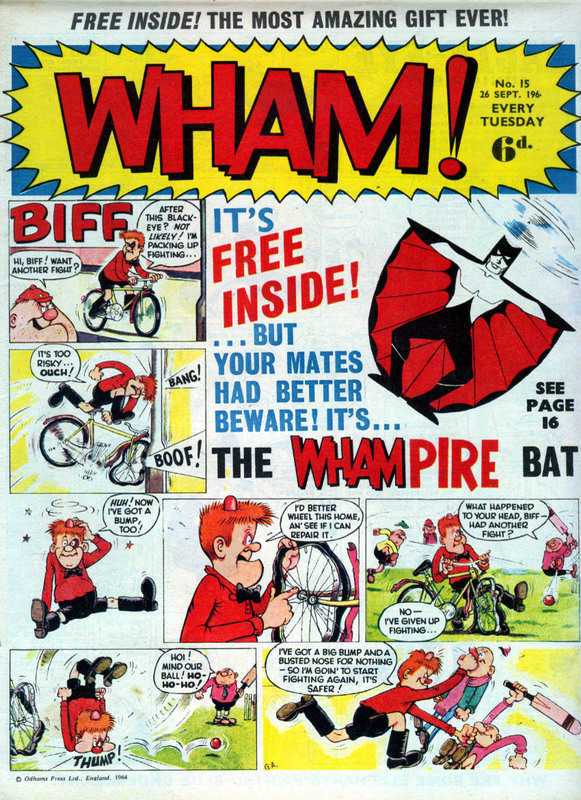 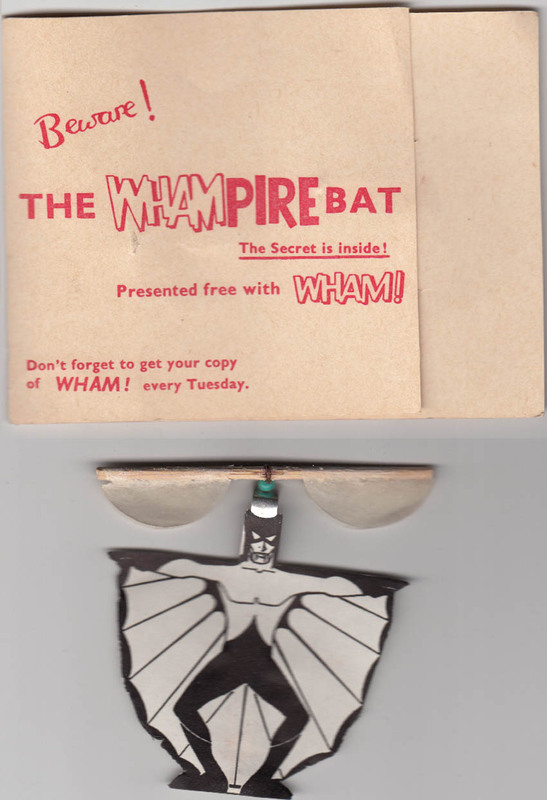 First off, the WHAMpire Bat from Wham! 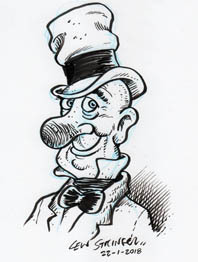 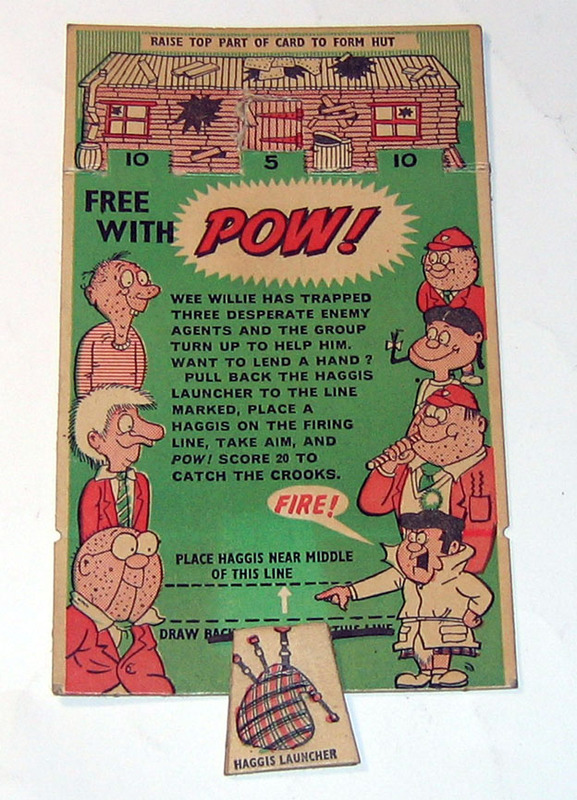 comic in 1964. This figure had very delicate wings and although the rubber band has now perished I presume it was wound up and the Whampire then suddenly flew out when the envelope was opened. 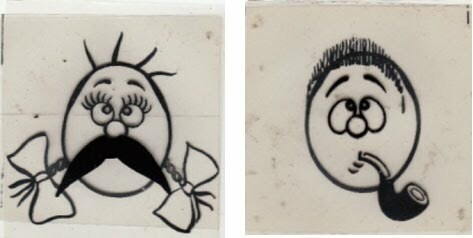 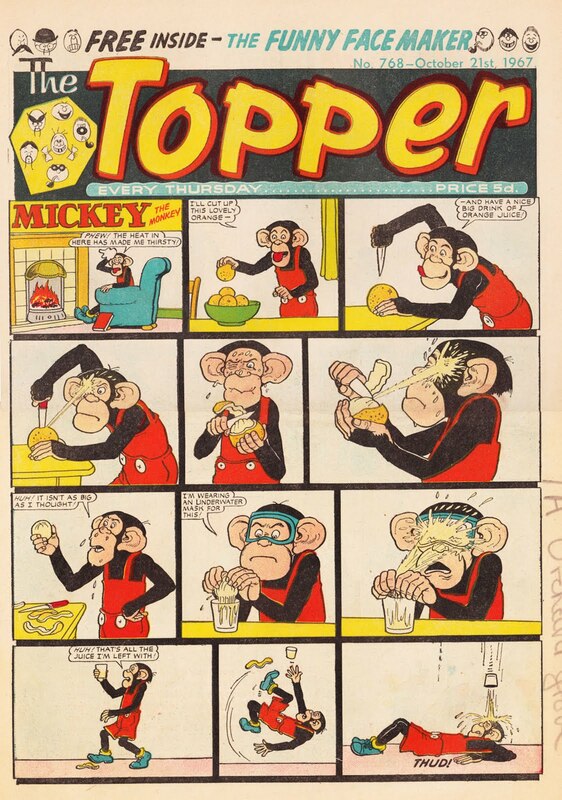 The same year saw The Topper treat the readers to The Funny Face Maker. 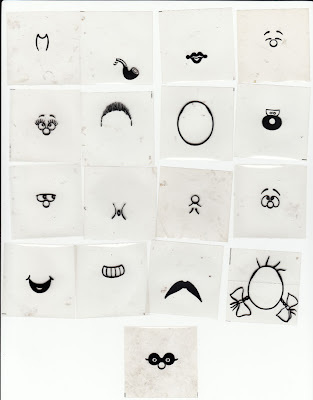 This was a sheet of clear acetate with cartoon facial components printed on it. 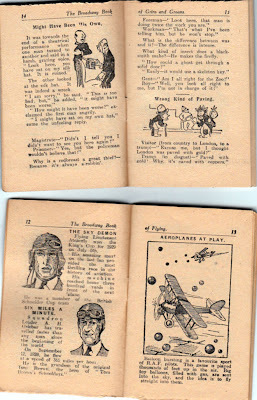 When cut into individual parts the reader could then assemble them into various photofit style faces. 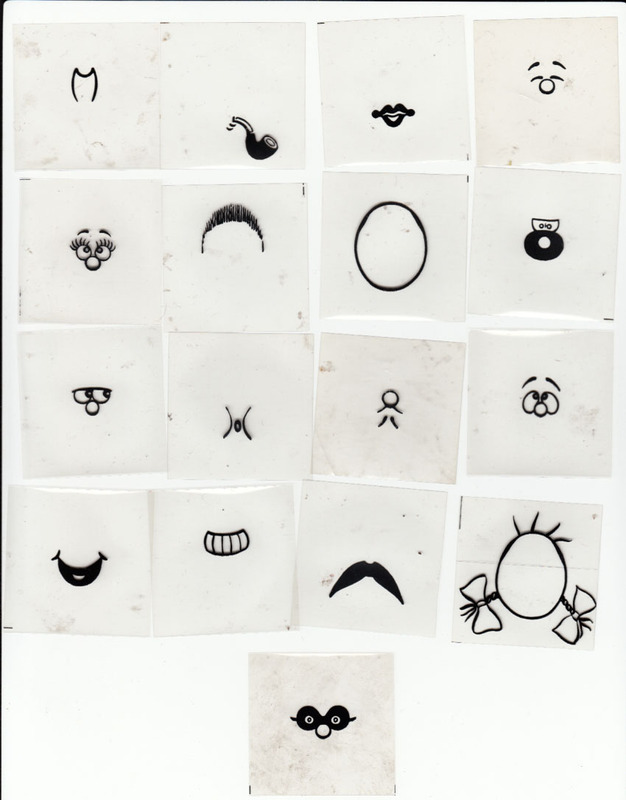 A simple idea but very amusing. 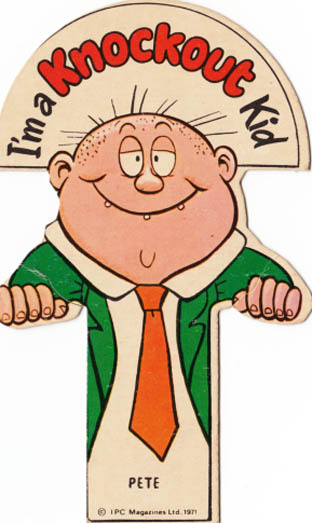 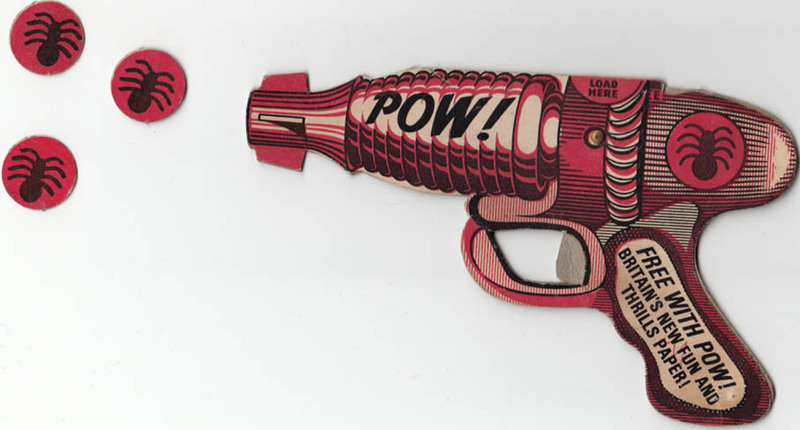 In 1971 IPC's Knockout weekly had an odd free gift; a little cardboard figure of one of the characters that you could pop into the breast pocket of a shirt or jacket so it appeared to be peeking over the edge. 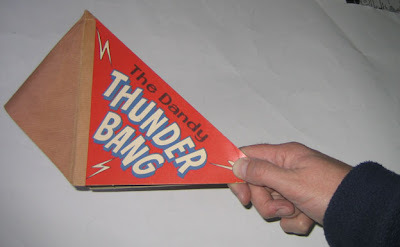 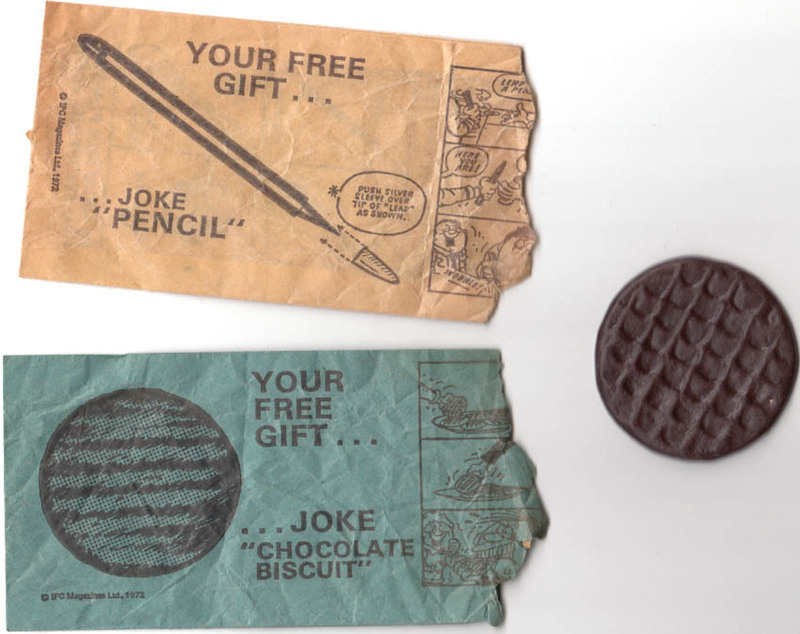 There were several to collect and it was pot luck which one you received. 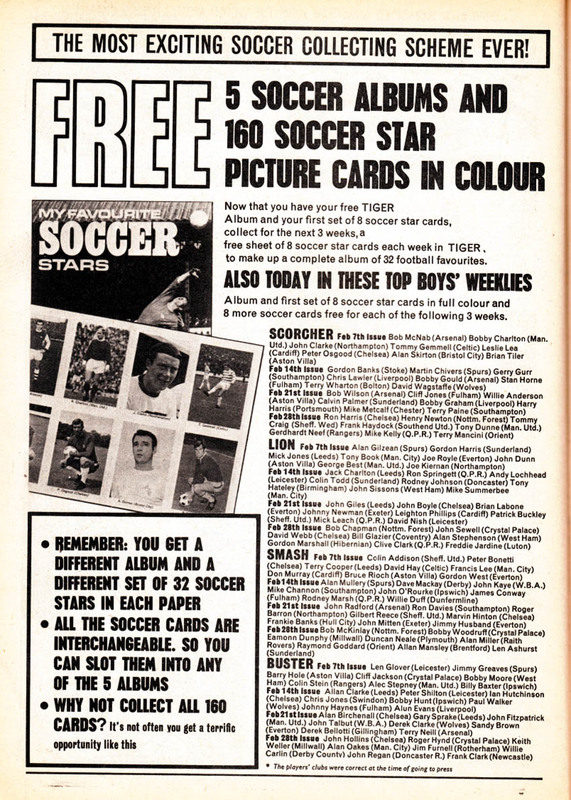 A bit of a useless free gift really, but one which a lot of people remember. 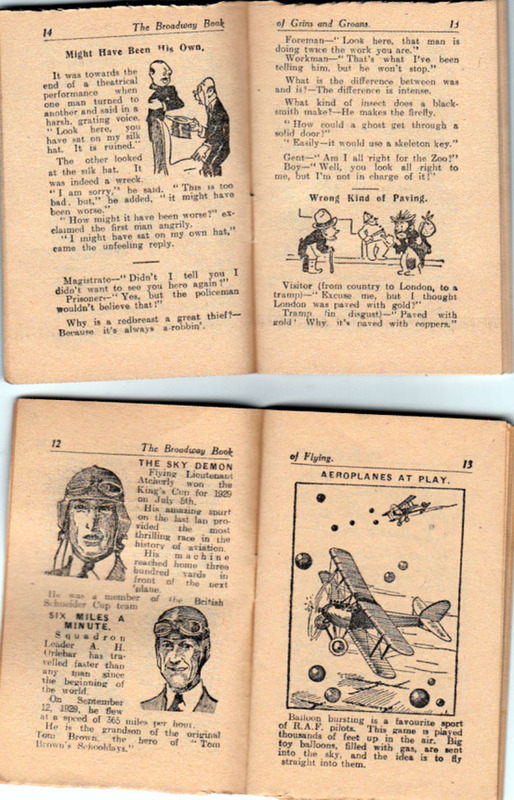 The educational magazine Look and Learn had gifts that were a bit more substantial as one might expect. 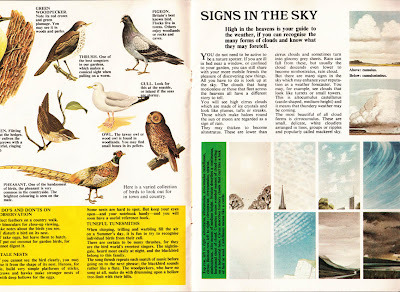 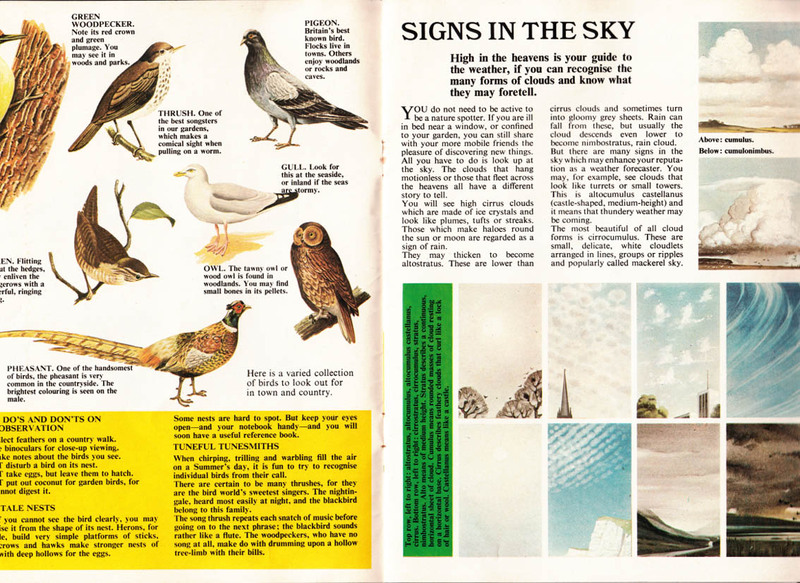 In 1971 it presented The Look and Learn Book of Records with the "help and co-operation" of Guinness Superlatives Ltd. 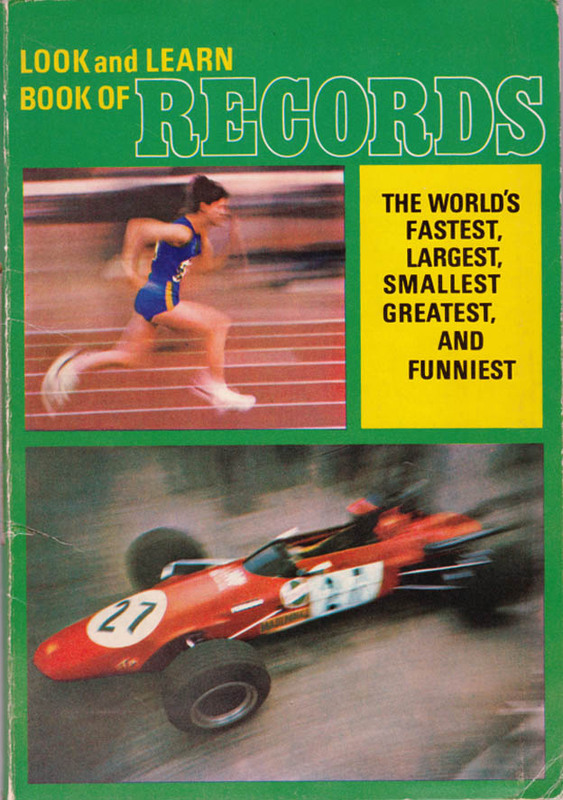 In other words it had permission to copy stuff from The Guinness Book of Records. 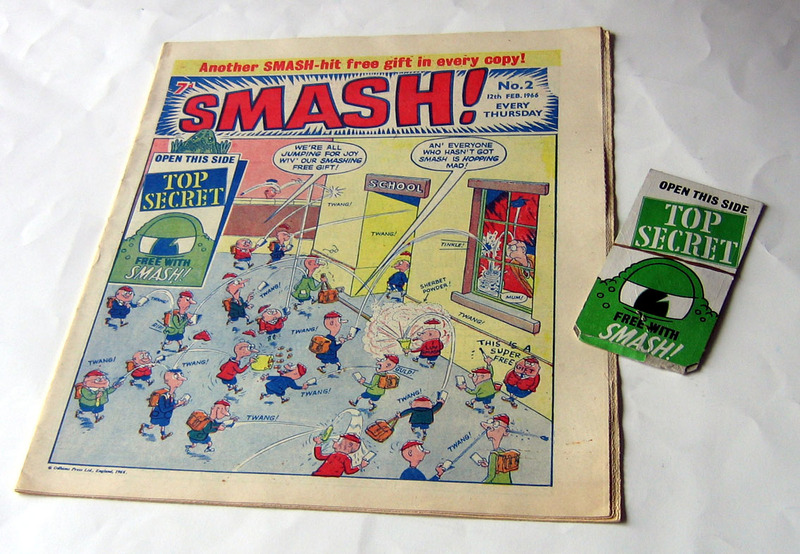 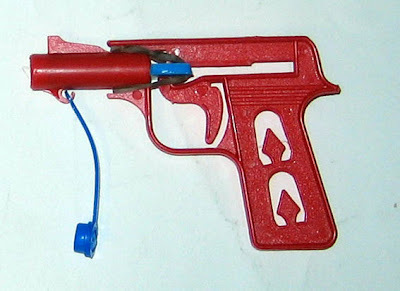 IPC launched Shiver & Shake in 1973, giving away a practical joke gift in issue No.1. 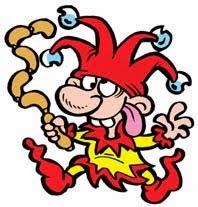 In order to sell more copies there was a choice of one of four practical jokes: a trick spoon, a trick rubber pencil, fake liquorice, or a plastic biscuit. 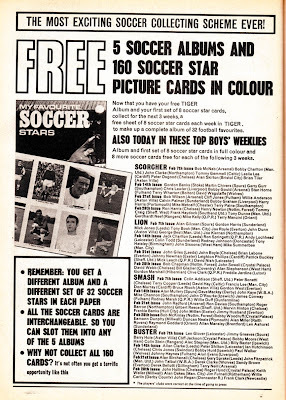 A few years later, in 1983, Victor gave away a similar gift. 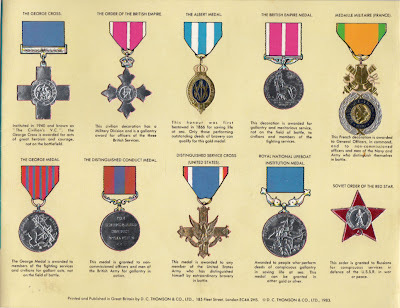 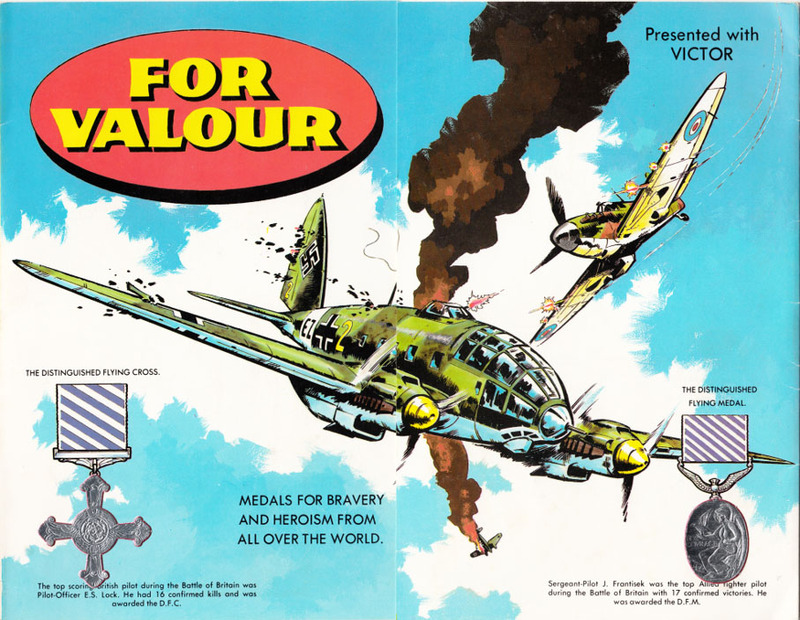 For Valour was a fold out card display which free replicas of medals could be affixed to. 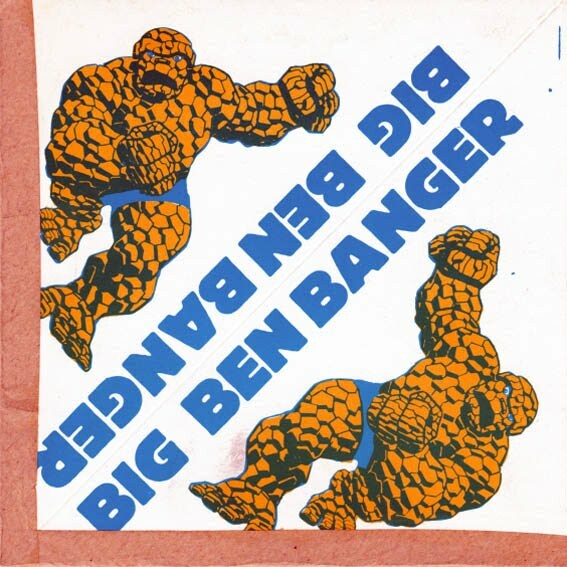 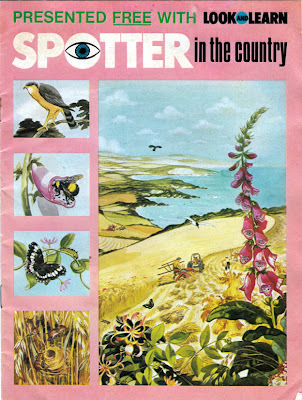 Again, the artwork is by Jeff Bevan. 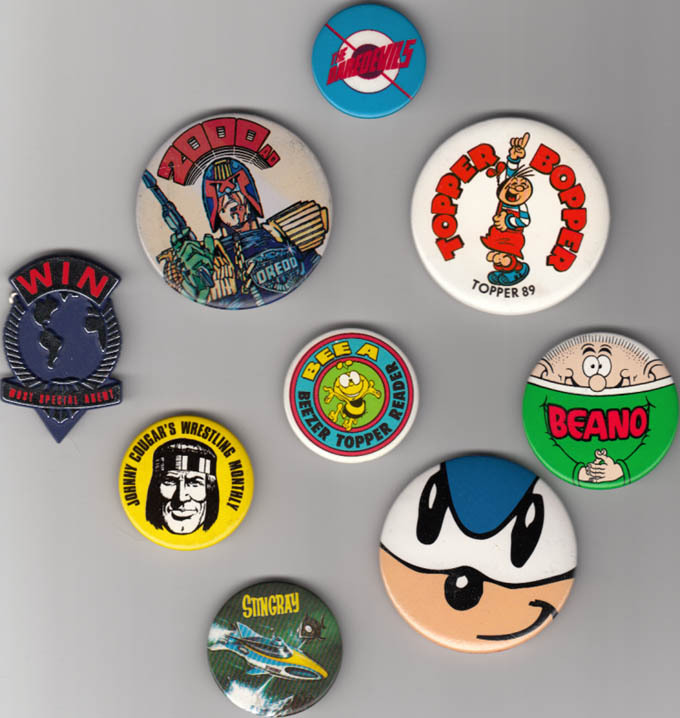 Another collection of free gift scans soon! 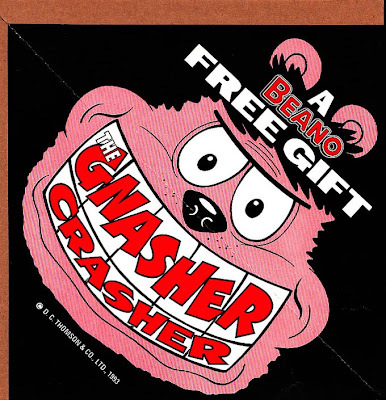 I've been promising to post an item about old free gifts for a long time now so here at last is part one of an occasional series. 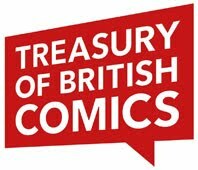 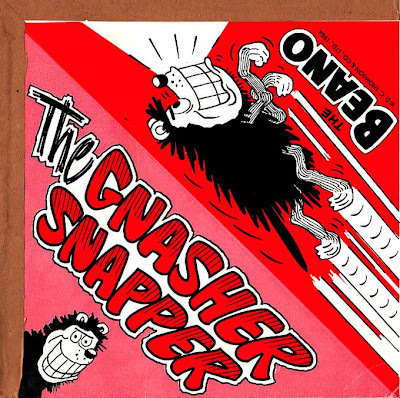 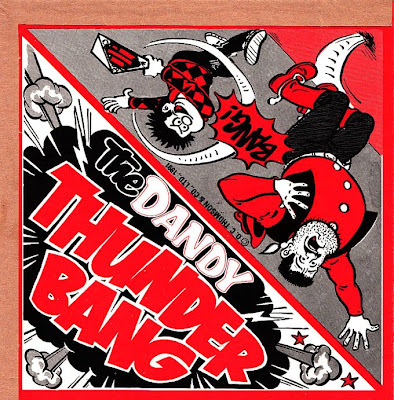 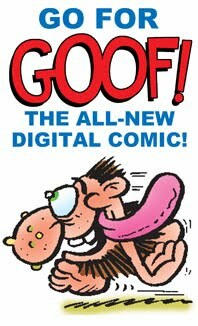 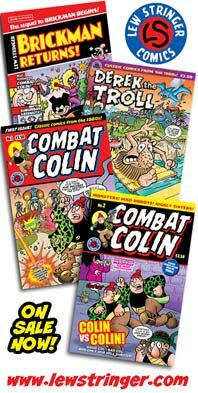 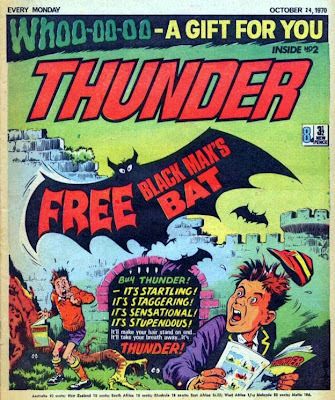 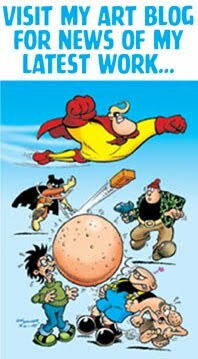 Free gifts have been a long established part of British comics almost since the beginning. 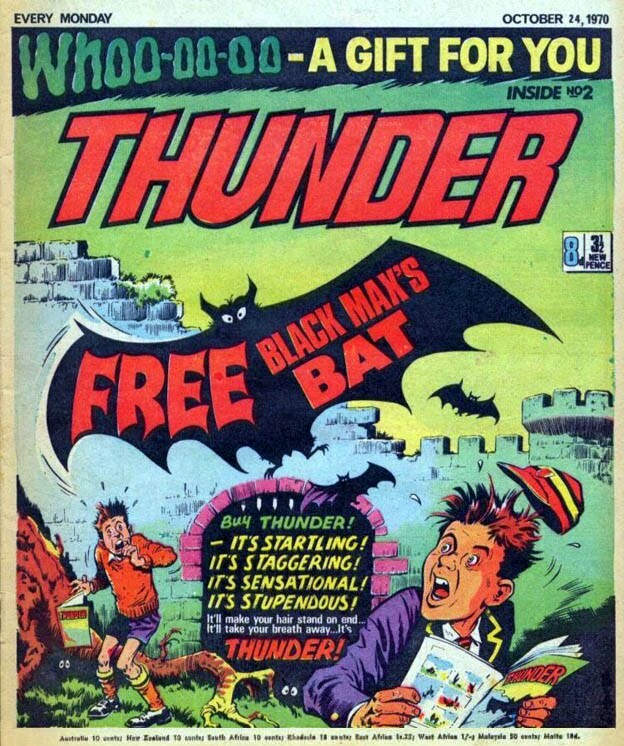 Today the novelty has lost its value, with most comics now being bagged with multiple gifts every issue. 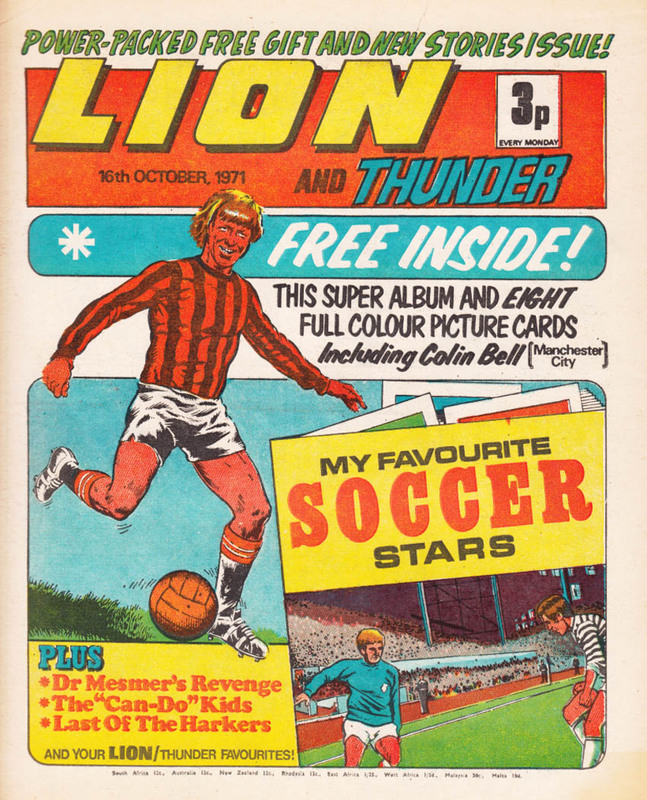 Years ago a free gift was a special treat, reserved for the first three issues of a new comic or for occasional promotions to boost the sales of a comic. 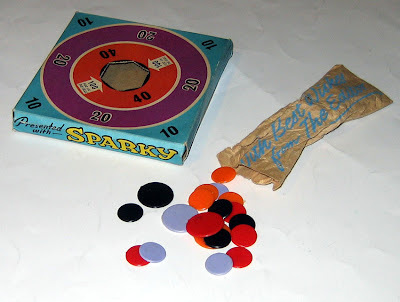 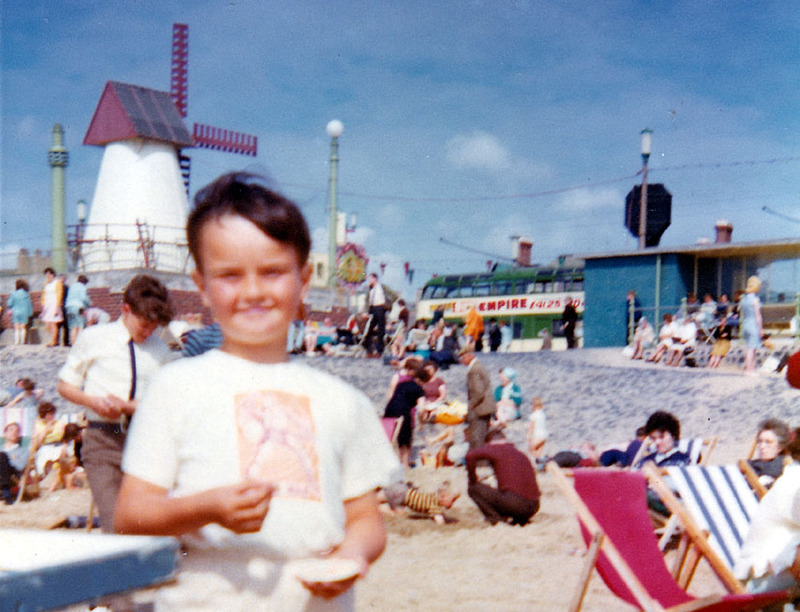 Free gifts back then were certainly more refined than the cheap plastic toys given away today. 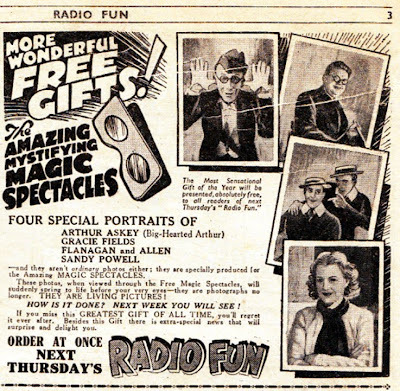 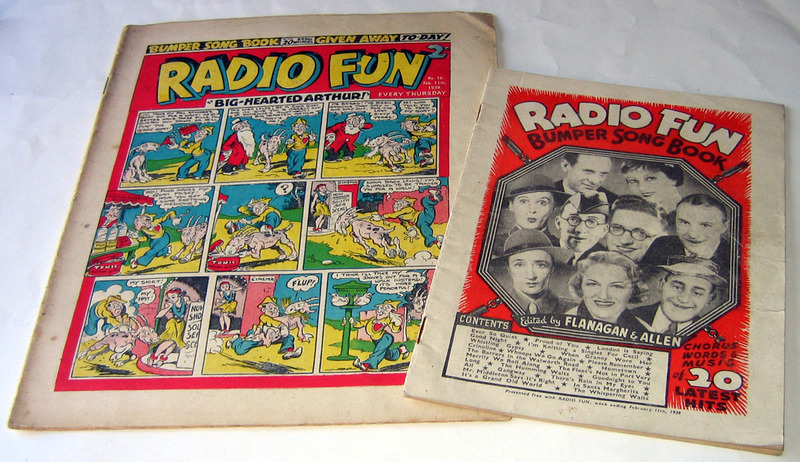 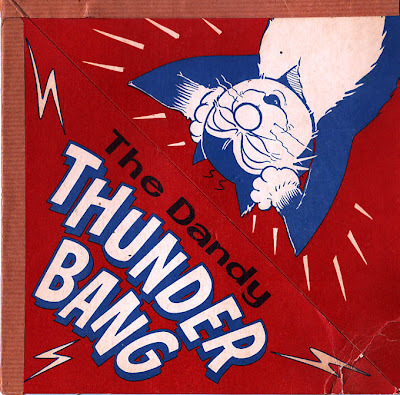 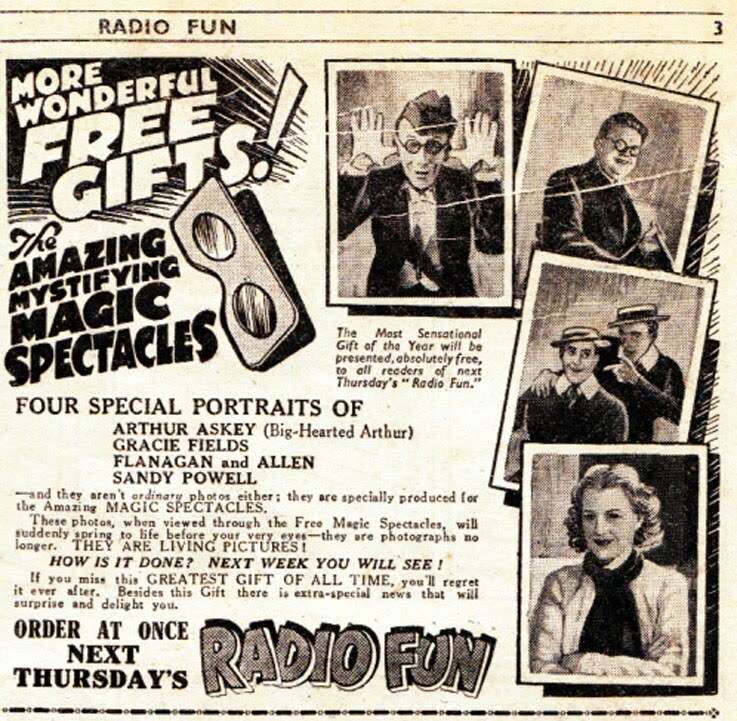 Issue No.18 of Amalgamated Press' Radio Fun dated February 11th 1939 presented a free Bumper Song Book with 28 pages of sheet music and lyrics to while away the winter nights. 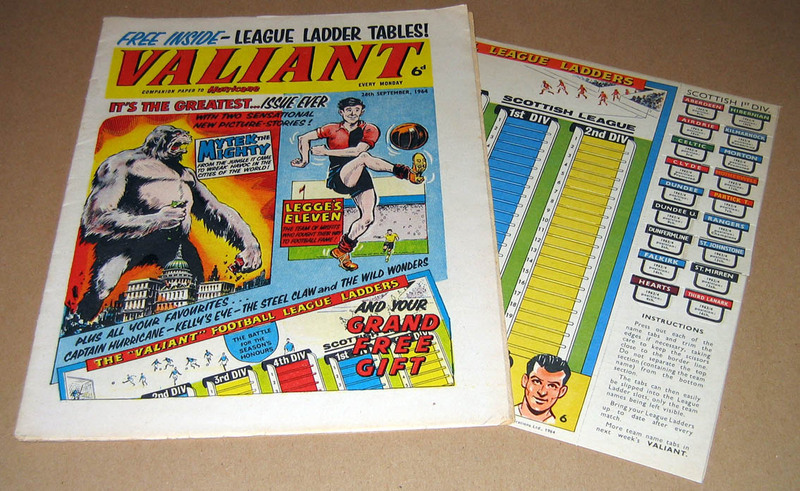 Moving on to 1963 and here's an early version of the Football League Ladders of the type that would later be given away annually with Shoot! 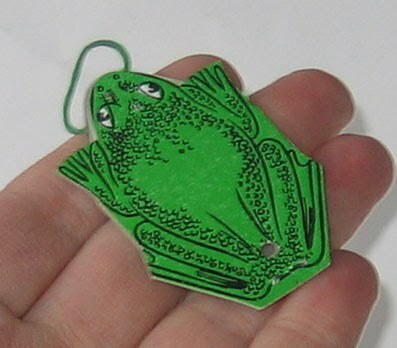 The flat cardboard frog was inside a card envelope which could be set to make the frog spring out. 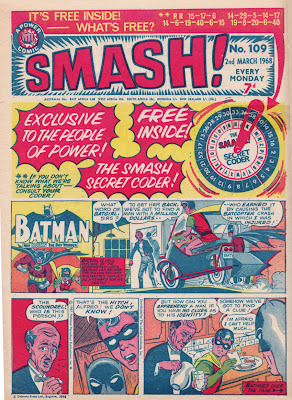 In 1968 Smash! gave away another gift, the Smash! 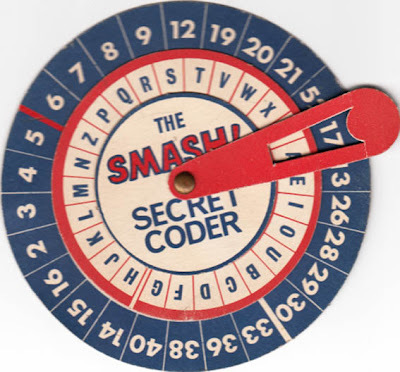 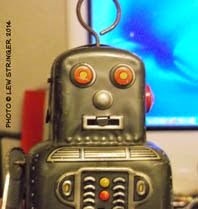 Secret Coder. Notice the brass pin in the centre. Free gifts were often held together by these sharp objects and I don't recall ever being cut by them. 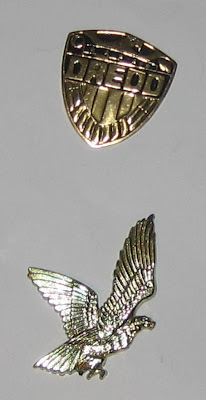 Today Health and Safety would insist on a wedge of text warning about the pin, if it allowed it at all. 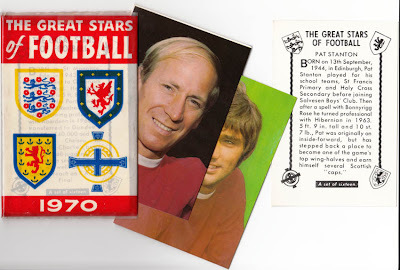 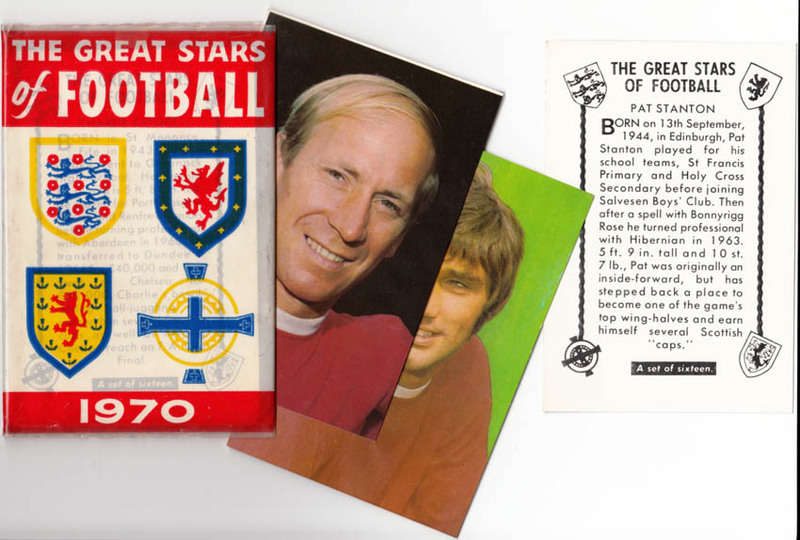 In 1970 D.C. Thomson revived The Wizard and in its second issue gave away a free plastic wallet and the first set of large colour cards for The Great Stars of Football collection. 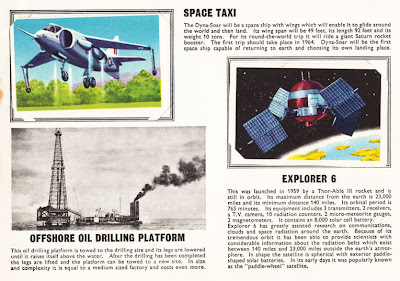 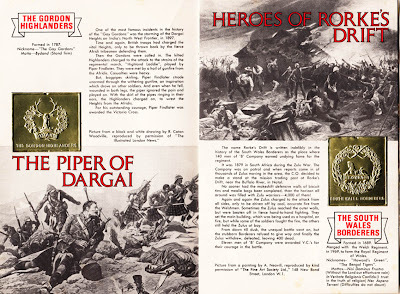 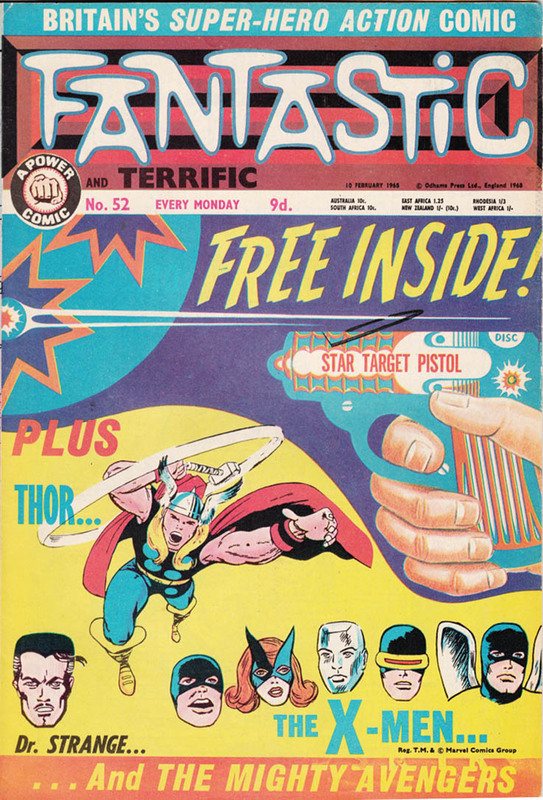 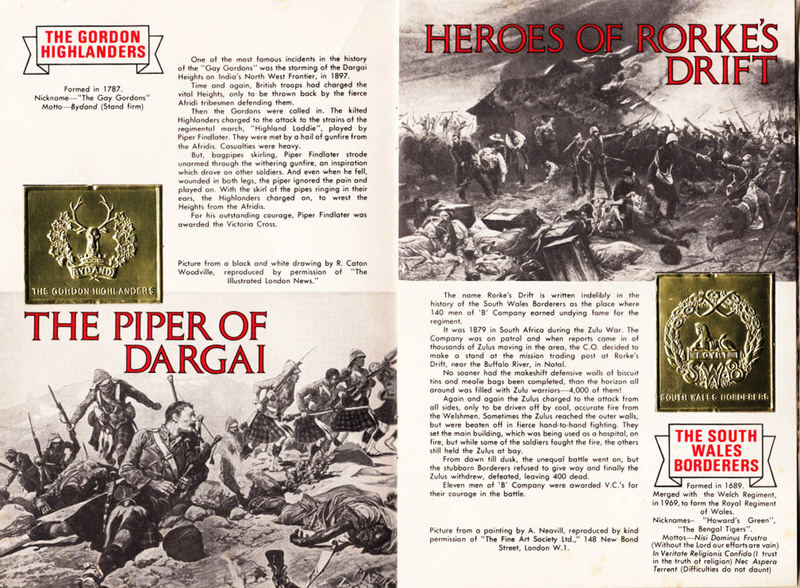 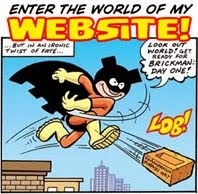 The second set appeared in issue 3. 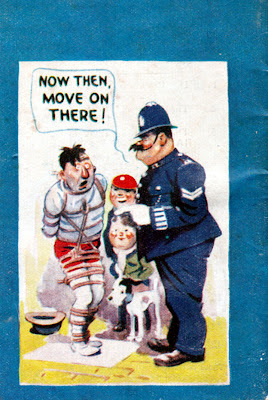 That's it for Part 1. I'll be scanning more random free gifts from my collection in the near future. 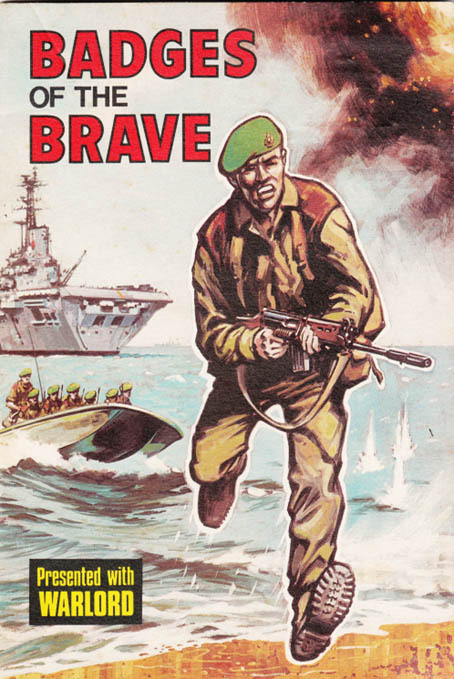 Monty and Hitler in Commando Team-Up action!